Today is Earth Day, so zero waste events are a good thing to talk about. Imagine having an event with a large number of people and having no waste! That is my idea of something called a zero waste event. Others may have alternate ideas, such as sorting out the recyclables and compostables before taking the rest to the landfill, but that’s a start. When I taught at the community college one of the projects I had my students do was to write a paper on the composting topic of their choice from my list of six. The topics were (1) institutional food wastes, (2) animal carcass composting, (3) manure management, (4) bioremediation, (5) construction and demolition debris, and (6) zero waste events. At the time I chose those topics there was little information on many of them and I gave them articles from BioCycle magazine to get them started. I was reminded of that when I attended the Mother Earth News Fair in Asheville, NC recently. Always looking out for the environment, Mother Earth News is careful when it comes to putting on their Fairs. Instead of single trash barrels, there were three containers in each spot. As you can see in the photo, each had a sign identifying what to put where. There was a place to deposit things destined for recycling, composting, or the landfill. The signs, lid tops, and plastic bag liners were color coded to further keep things straight. The signs indicated this was managed by Danny’s Dumpster. I didn’t find Danny, but when I spotted one of his employees I stopped him to ask some questions. 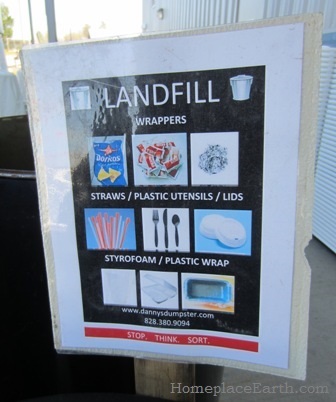 Danny’s Dumpster works with businesses and events on a regular basis. They even have their own composting facility and sell compost. 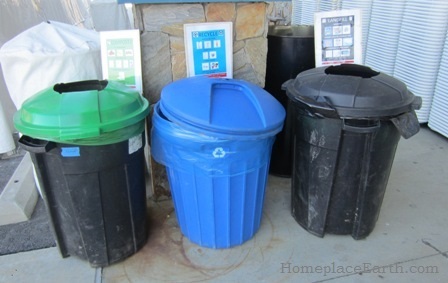 Their website says that Danny’s Dumpster specializes in waste reduction while striving to make environmentally responsible decisions both affordable and convenient. Affordable and convenient are what everyone has been waiting for. Unfortunately, the general public doesn’t want to go out of their way or spend extra money to recycle. It will be nice to see this become the way of all trash haulers. This business is beginning to work with schools to take their cafeteria waste. In the mid-1990’s I volunteered with the garden program at my children’s elementary school and pioneered composting the cafeteria waste right at the school. 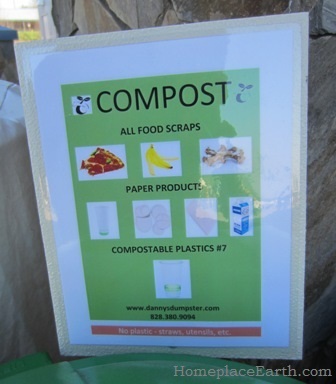 The students put their food waste and paper napkins into the recycle bins and two students were assigned to empty the bins into the compost piles each day, along with leaves for the needed carbon. It worked great, but not too many adults really understood the importance of what we were doing, or the necessity. That system operated for the four years I was a volunteer, but didn’t continue more than about a year after that. My experience at the school made me realize that I needed to devote my time to teaching adults so that more of them would understand, putting more people out there to teach the children and others. Those elementary school students are adults now. They know this can work because they were doing it way back when. Maybe they’ll be the ones to make a difference in their communities. What are you throwing away? Each household should sort its own waste and try to have less (or none). A compost pile can take care of the food scraps, but there are lots of other waste items to contend with. When food goes from the garden to the table, there are no containers to dispose of. Furthermore, when it is preserved at home, the containers that are required can be used over and over. I still use canning jars I bought 40 years ago. Packaging is a big waste. Bringing less stuff home of any kind will reduce the packaging you have to throw away. 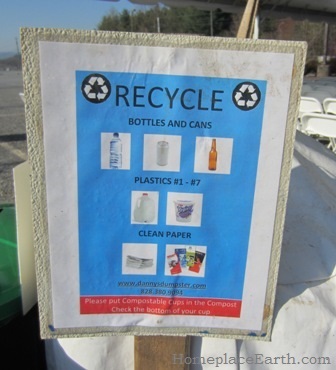 In your household can you have a zero waste event and really make it zero waste? We worked with that goal in mind when our daughter got married in 2010. We came close with less than a full bag of trash for the landfill. You can read what we did at https://homeplaceearth.wordpress.com/2012/06/12/homegrown-wedding/. It is encouraging to see how much the subjects I assigned are in the news in the years since I first gave my students that project. Animal carcass composting was thought to be quite an unusual subject at the time and much of the available information was about poultry farms composting, rather than incinerating, dead chickens, although composting roadkill was the subject of a BioCycle article. Virginia now has a composting program primarily for deer killed on I-81 in the western part of the state. The resulting finished compost will be used in landscape maintenance. Demolition debris is being separated and recycled. Brown fields are being cleaned up with bioremediation. As a society we are beginning to take more of a holistic approach to what we do, taking into account the complete cycle of our resources and our actions. There just might be hope for the world after all.